Bring salted water to a rolling boil. Add the pasta and let it come to a boil again. Boil, uncovered, until pasta is al dente, about 7 to 8 minutes. Scoop out 1 cup of the pasta cooking water and set aside. Drain the pasta. In a large skillet or casserole, heat the olive oil over medium heat. Once it is hot, but not smoking, add the garlic and cook just until fragrant, 20 to 30 seconds, stirring continuously. Stir in the rosemary, oregano, thyme and marjoram, and cook for 30 to 40 seconds. Add the guajillo chiles and cook, continuing to stir, for another 20 to 30 seconds. You want them to gently brown, but not burn. Add the pasta to the skillet and toss well. Pour in the reserved pasta water, toss and cook for another couple minutes. Remove from the heat. Taste and season with salt and pepper as needed. Serve garnished with freshly grated cheese and chopped parsley. 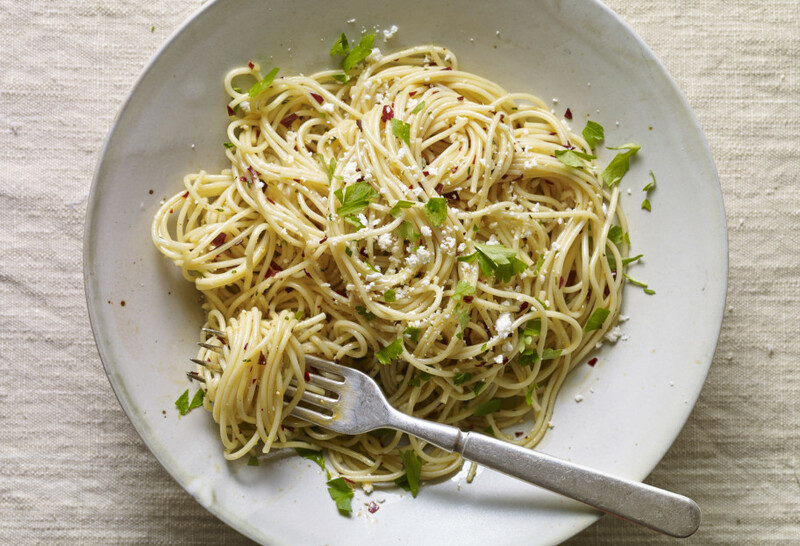 hello, we just saw this episode yesterday and i am looking forward to trying this recipe instead of the simple sauted garlic and salt pasta “sauce” i sometimes make for our Sunday afternoon snack. we’ve been cooking spiral pasta because i don’t think our grocery store sells organic spaghetti in bulk, which is the way i prefer to buy many foods. i think this was the same episode where you visited an Italian shop in New York, which i still have to look up, and used a name i think your father used to call you that sounded like baldia but that can’t be right! we also can’t drink much alcohol and i can get sleepy just from eating too much food! speaking of drinks, do you ever make Margaritas with Damiana, which is the way we first had them in Cabo San Lucas? I don’t have a margarita recipe with Damiana…but I’ll try to work on one soon. And enjoy the pasta, Carl! Hi Pati, this recipe doesn’t look like the “Mexican-Italian” version I saw on your show tonight. Something is missing – what gives it the orange-red coloring to the pasta? The Guajillo chiles? Sometimes the chiles give off more coloring than at other times, but the color comes from the chiles. Enjoy the pasta, Mari. First of all, my husband & I both enjoy your show! I’ve made this dish several times, but recently decided to try it with rice instead of pasta. While my husband is a big fan of rice, I am not; however, this recipe made it delicious! Thanks for all your wonderful ideas and recipes! So glad you made the recipe your own, Juanita…rice is a great idea! I made this dish a few weeks ago, and I loved the flavor. I also made your chicken chipotle pasta casserole with pico de guac for a few friends, and it was a big hit! I absolutely love your show. Your passion for cooking Mexican food has inspired me to try new combinations of flavors in cooking (and eating :). In fact, when I want a lift, I watch one or two of your shows, and I smile. Your delightful enthusiasm is contagious 🙂 Thank you Pati. Keep on doing what you are doing! Thank you so much for your lovely message Gina! I made a double batch just last week to take to work. We had it for breakfast and lunch. I think it has ruined me for regular spaghetti. However, I had pieces of guajillo chili pieces all over my kitchen and in my hair. I also missed the part about removing the seeds so it was quite warm but there was little left to take home at the end of the day. I used fresh herbs but scaled back the rosemary a bit. I ended up using kitchen shears for part of the chili ‘dicing’ and none of my sharp chef knives seemed to do the job. I think my hands are too weak. I will consider quickly and lightly roasting the seeded chilies and reconstituting in hot water next time around. Otherwise, for my part I would need to add an extra 30+ minutes to my prep just for the chilies….and I would wear gloves. Thank you for the recipe. Sorry to hear that the chiles gave you some trouble…but I’m glad that you enjoyed the pasta! I love your show and have learned so much from watching you and following you on your journeys. I have tried your Tikin Xic and it was a big hit with my family. Can’t wait to try this pasta recipe as well. Thank you. Oh I hope the pasta is as much a hit as the Tikin Xic! Oh thank you so much Margaret! Park I just love your show, and I have gone to our public library and checked out your recipe books. I have a whole bunch of your recipes and have made them for my daughter & myself. To this wonderful & delicious recipe I added some onion & green bell pepper. It tasted great. I enjoy your program so much.It’s so easy to follow and delicious!! Thank you Patti. Hi Will, No need to rehydrate the guajillos. Just stem, seed & finely chop. Thank you for watching! I hope you try the pasta!! We LOVE your Rodrigo Fish recipe from your cookbook…..it’s ABSOLUTELY OUTSTANDING!!! Hi Pati…do I need to rehydrate the dried guajillo chilies before I use them in the pasta? THANK YOU!!! No, you don’t! They soften in the oil. Thank you Pati and I LOVE your recipes!!! Hello! Te descubrí hace solo unos meses, Pero mañana mismo empiezo por hacer la pasta! Vi el programa esta mañana, y creo que ya soy un fan! So glad it worked for you guys! Delicious! It reminds me of a dish my Italian mother used to make, Chicken E Olio. Very similiar, but without the chilies. Looking forward to another season of your shows! Thank you, Joanne! I bet your mother’s Italian version is out of this world. I love your show! I’m a Spanish teacher and I love to cook Mexican food. Can’t wait to try this pasta tonight! Hope you liked it, Alora! We aren’t big pasta eaters as a meal here however I love trying all your recipes. This is yummy, I had left over Kofta (hamberger) & I mixed it altogether & of course it was a hit! That sounds like a great mix, Sunnie! I saw this episode this morning (26 march 2014) And decided to make the pasta. The meal is tasty but I had to used dried chilies as no fresh were to be found. The meal tasted as if it was missing the full range of flavor and I suspect it is due to the dried chilies. Hola Gary, Thank you so much for trying it! The guajillo is a dried chile so sounds like you had the right one. We saw this episode last night and today my husband made this dish, it was awesome, thank you so much for your show, I cant wait to share this recipe with my mother in Mexico. So glad to hear, Imelda!